Need a hot breakfast to warm you up? How about a mild, warm late night snack to help you fall asleep? A warm bowl of farina can boost your energy and get you moving in the morning, or calm a tired mind at the end of a busy day. This grain cereal is a great backdrop for other flavors and packs a large nutritional punch! What Does Farina Taste Like? The best farina definition is that of a background. It's warm and mildly sweet. On its own, farina is fairly bland. It works well as a staging area for fresh fruit or fruit preserves; a little sweetener and some cinnamon will give it a boost as well. Farina has a natural mild sweetness, but will likely need amenities to bring it up to a truly sweet flavor. Sweet rating: 7 of 10. If your farina is sour, check the expiration date on your milk. If the package smells musty or sour when you open it, don't eat it. Grains are great food for bacteria as well as humans. Sour rating: 0 of 10. Salty farina means you just overdid with the salt before you cooked it. It's not the end of the world; try adding fruit preserves or maple syrup to the bowl to improve the flavor. Salt rating: 1 of 10. Many cooks like to make farina with milk rather than water for a lush, creamy texture. Unfortunately, some milk, such as soy or almond, has a limited heat tolerance and will scorch. If your farina is bitter, you likely burned the milk. Discard it and try again. Bitter factor: 0 of 10. The word farina is based on the Latin, meaning meal or flour. This cereal is a milled grain, made from the wheat germ and the endosperm. The wheat germ is the portion of the grain where the nutrients are most dense. This cereal is quick to cook and loaded with healthy features! In the bowl, farina can be a little boring to study. It's an off-white bowl of warm, yummy goo. You can boost the nutritional value and the visual appeal with a sprinkling of fresh blueberries, sliced bananas (how long do bananas last? ), a drizzle of maple syrup or honey, or a sprinkling of cinnamon. If you can tolerate sodium, add a little bit of salt in the cooking; it will boost the flavor of the fruit and natural sweeteners. Statistics on farina nutrition are fairly straightforward. If you can tolerate gluten and are looking for a way to add a bit of warmth and comfort to your diet without loading up on empty carbohydrates, learning to cook farina is worth your time! Farina is quite quick to cook, but needs to be monitored as you cook it. This video features farina cooked in milk, a little butter and sugar. Milk can scorch and sugar can burn, so once the liquid heats up, you need to whisk in the farina and keep stirring to keep the grain from getting lumpy and burning to the pan. Because farina is so mild, you can use it as a background for many unique flavors. Tired of cereal and berries? Try Dominican style farina, loaded with cinnamon and cloves. What a holiday treat! Dried fruit will also add to the rich texture of farina. This farina recipe is a combination of cereal, brown sugar, roasted almonds and dried apricots will give you a solid source of breakfast fuel on the coldest day. Farina is wheat, so if you're gluten intolerant or grain sensitive, this probably won't be good for you. Is farina gluten free? No. This natural binding protein is what causes it to form lumps if allowed to stand, unstirred, on the heat source. If gluten is an issue, try cream of rice or cream of buckwheat. However, if you can tolerate wheat and would like to add a hot cereal to your day, farina is a quick-cooking way to add valuable nutrients to your diet. Farina is high in calcium, iron, and B vitamins. The wheat germ inherent in farina is a terrific source of antioxidants and vitamin E as well. Unfortunately, farina is heavily milled to make it quick to cook, and is therefore low in fiber. To boost the fiber, you can add bran or flaxseed directly to your cereal. A word about sugar: It's easy to make farina or any breakfast cereal a sugar highway. However, you might be better off skipping your favorite flavored coffee for a bowl of farina. As possible, add natural sources of natural sweetness to your cereal, such as fresh fruit. A pinch of salt will bring out the natural sweetness of the grain. Try to train your taste buds to be sensitive to natural sugars by cutting back on granular sugar additions. What is Malt O Meal? Functionally, farina and Malt O Meal are interchangeable, so if you can't find the package labeled farina, Malt O Meal is a great farina substitute. 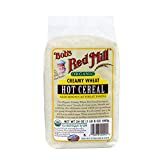 It's a ground wheat product that can be boiled into a creamy cereal. Maltomeal ingredients include the germ and endosperm of the mature wheat grain. ​Maltomeal nutrition statistics are quite similar to those of farina, unless it's labeled as fortified; fortified cereals are formulated with nutritional additives, making them even more important in the diet. When comparing Malt O Meal to Cream of Wheat, the flavor difference is nearly indiscernible. Both are wheat products, both are cooked hot, and both are served (generally) with sweet additions. Cream of Wheat is more finely ground than Malt O Meal and results in a smoother texture. However, it may take more Cream of Wheat to provide a full feeling, as there's less bulk. A hot, hearty breakfast used to be a necessity when the diner was heading out to face a day of manual labor. If your labor includes parking yourself in a chair and typing on a keyboard, a hot breakfast might just put you to sleep, and may lead to sluggishness and even weight gain. However, farina is a nutritious dish and may be a welcome addition at the end of the day or as a midday snack or even as part of your lunch. Did you enjoy this guide? Did you enjoy this guide? Let us know in the comments with your favorite farina recipe or any substitutes that you prefer.